Iranian Supreme Leader urges Iran's armed forces to increase their power to "scare off" the enemy. Iranian Supreme Leader Ayatollah Ali Khamenei on Sunday urged Iran's armed forces to increase their power to "scare off" the enemy, Reuters reported. His statement came just before Iran's elite Revolutionary Guards said it fired seven missiles in an attack on Iraq-based Iranian Kurdish dissidents that killed at least 11 people on Saturday. "Increase your power as much as you can, because your power scares off the enemy and forces it to retreat," Khamenei said at a graduation ceremony for cadets of Iran's regular armed forces. "Iran and the Iranian nation have resisted America and proven that, if a nation is not afraid of threats by bullies and relies on its own capabilities, it can force the superpowers to retreat and defeat them," Khamenei added, according to Reuters. 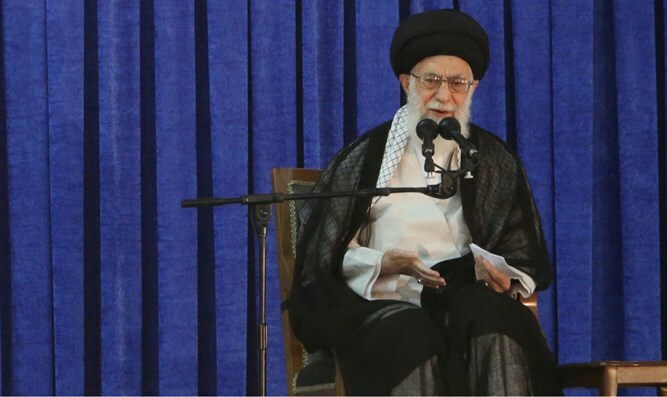 Last week, Khamenei denied the Iranian regime faced any possibility of a major armed conflict in the foreseeable future, but nevertheless called to strengthen the Iranian military. His comments come amid ongoing tensions in the wake of US President Donald Trump’s decision this past May to withdraw from the 2015 nuclear deal signed between Iran and world powers. Trump recently signed an executive order officially reinstating sanctions against Iran. In response, Iran has threatened that it will begin uranium enrichment beyond previous levels if the remaining parties fail to uphold the 2015 nuclear deal. "We will not return to previous levels if our counterparts leave the JCPOA (nuclear deal), but will instead reach even more advanced levels," Behrouz Kamalvandi, a spokesman for Iran’s Atomic Energy Organization, said last week. Last week, Khamenei claimed the United States and Israel were waging a media war to discourage Iranians. “Today, (Iran’s) Islamic system faces an all-out economic war that is carefully guided by a war room, but along with this war, there is a major media and propaganda warfare that is often neglected,” he said.